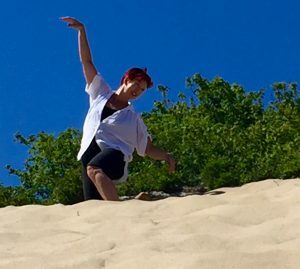 Constance offers a movement practice that invites you to drop deep into being and connect with your inner wisdom/playfulness/expression. Experience pleasure and ease and release of tension. Based on the somatic principle of including your whole self, you will be supported to discover self-expression and wholeness in embodied movement. Class begins with guided contemplative movement to bring your focus inward. As you move gently with attention to sensation, you begin to release muscular tightness and connect to your center. Guidance into more expansive movement brings spaciousness to body and mood. As you tune into what increases pleasure and sensitivity your innate internal intelligence becomes available. Creatively combining guided action and imaginative flow reveals playful possibilities, expanded field of awareness and greater choice in movement after class. We will move to a wide variety of music that Constance has collected over her many years of teaching dance and movement. Claim your space, time, and attention for self care. Enjoy this Yummy Yoga class infused with lots of Alexander hands-on guidance. Peer Practice of the Desert-Hosted the first Sunday of every month. Peer Practice satisfies the adult mover’s desire for autonomy and body-friendly movement. Three dancer/movers in the desert facilitate a (semi) structured format with questions and ideas that we interact with. Each facilitator will introduce aspects of her personal practice and interests and contribute material or ideas to explore. Some movers will focus on aspects of dance technique such as flow or spinal articulation, while some will bring a deep somatic experience and others concentrate on improvisation or presence. The structure of class allows for these different approaches to coexist simultaneously, encouraging individuals to follow their interests and switch between different modes over the course of a single class session. Class can become a collective experience, an opportunity to collaborate on a rich space for exploration. Constance is part of the collective Desert Movement Arts, which offers classes, workshops and performances. infused with somatic awareness, inspired by the Hawkins Technique. Fridays at 11am.